TUCSON, Ariz. (AP) — A federal prison inmate in southern Arizona has been sentenced to four years behind bars for sending threats to former President Barack Obama and former Attorney General Loretta Lynch. Federal prosecutors say 40-year-old Roger Dale Godwin previously pleaded guilty to making threats against government officials and mailing threatening communications. WASHINGTON (AP) — House Republicans who have spent the last two years arguing that there was bias in President Barack Obama's Justice Department are preparing to subpoena two key witnesses in the final weeks of their majority — former FBI Director James Comey and former Attorney General Loretta Lynch. WASHINGTON (AP) — The Justice Department's watchdog has finally weighed in on the FBI's handling of the Hillary Clinton email investigation and nobody comes out looking good. A group of conservative Republicans sent a criminal referral to the Justice Department Wednesday asking prosecutors to consider bringing charges against former FBI Director James Comey, former Attorney General Loretta Lynch, former Secretary of State Hillary Clinton and others involved in the probe into Mrs. Clinton's emails. They also complained that the FBI and Justice Department mishandled the so-called "Steele dossier" with salacious and unverified claims about then-candidate Donald Trump. Former attorney general Loretta Lynch defended her handling of the investigation into Hillary Clinton's private email server on Sunday amid criticism from former FBI director James Comey. In a statement on Sunday, Ms. Lynch said she "fought corruption of all types" during her tenure at the Justice Department, "whether by elected officials from both sides of the aisle or within organizations like FIFA." (WASHINGTON) -- Former Attorney General Loretta Lynch says former FBI Director James Comey didn't appear concerned by the decision to call an inquiry into Hillary Clinton's private email server a "matter" rather than an "investigation." Lynch's comments in an interview with NBC News released Monday are in contrast to congressional testimony Comey gave last June, when he said her handling of the probe gave him a "queasy feeling." WASHINGTON (AP) — The Justice Department has turned over to Congress additional text messages involving an FBI agent who was removed from special counsel Robert Mueller's investigative team following the discovery of derogatory comments about President Donald Trump. Detroit — Former U.S. Attorney General Loretta Lynch will be the keynote speaker for Wayne State University's annual Martin Luther King Jr. Tribute on Friday at the Max M. and Marjorie S. Fisher Music Center. Lynch, the first African American woman to be appointed U.S. attorney general, will also sit for a moderated chat and question-and-answer session with local middle and high school students at the sold-out event. Governor Roy Cooper honored six people, including former United States Attorney General Loretta Lynch, at the North Carolina Awards ceremony Thursday night in Raleigh. The North Carolina Awards are the highest civilian honor given by the state. They are presented to people with significant contributions to the state and beyond for achievements in the fine arts, literature, public service and science. CAMBRIDGE, Mass. (AP) — Several justices on the nation's highest court are in Massachusetts to celebrate the bicentennial of Harvard Law School. WASHINGTON (AP) — Republicans and Democrats on the Senate Judiciary Committee are seeking information about alleged political interference by former Attorney General Loretta Lynch into the FBI's investigation of Hillary Clinton's use of a private email server. Since July 26, 1908, we have had the elite Federal Bureau of Investigation, an outstanding law enforcement agency of dedicated agents, staff and labs. Through the years, they have endured rogue agents, extraordinary captures, agents killed in the line of duty and kept this country safe for decades. While the Hillary Clinton investigation was ongoing, U.S. Attorney General Loretta Lynch asked Comey, the director of the FBI, to refer to it as a matter, thus changing the FBI to the Federal Bureau of matters, unofficially, of course. The question that wasn't asked of Comey was, “Mr. Comey, was that before or after Ms. Lynch spoke with former POTUS Clinton in Phoenix?” Does Sen. Gillibrand, D-NY, think her popularity in Hollywood will increase if she uses more profanity in her speeches about POTUS Trump now? Poor James Comey. First his old boss, Attorney General Loretta Lynch, directed him to convert an FBI “investigation” into a mere “matter,” after her one-on-one tarmac chat with former President Bill Clinton, whose wife was the target of said "matter." Then a second boss, President Donald Trump, repeats the one-on-one treatment, “hoping” Comey can go easy on another target, former National Security Adviser Michael Flynn. CINCINNATI (AP) — Cincinnati will update a 15-year-old policing plan crafted in the wake of a police shooting and riots after some of provisions were undercut by budget cuts and leadership changes. The city announced Friday a voluntary "refresh" of the collaborative agreement established after the 2001 shooting death of Timothy Thomas, an unarmed black man killed by a white officer. AURORA | Living in interesting times can be a blessing or a curse. Colorado’s marijuana industry finds itself in an interesting times. Durham native and the 83rd Attorney General of the United States Loretta Lynch spoke at the Duke University School of Law's commencement ceremony Saturday. "It's good to be home," she said. Lynch did not shy away from tough conversations, touching on hotly debated topics throughout her address. She said there is no better time to be lawyer than now. Lynch had a firm message to the newest law degree recipients. Law, she said, is central to many current controversial debates. The Trump administration is dropping a lawsuit against North Carolina after the state moved to undo House Bill 2. Justice Department lawyers filed a motion Friday to dismiss their federal lawsuit. The move doesn't directly affect separate pending litigation by LGBT rights advocates who say the new North Carolina law doesn't go far enough to ensure rights for all. CAMBRIDGE, Mass. (AP) — Former U.S. Attorney General Loretta Lynch on Friday encouraged her successor to remember the American people are the Department of Justice's clients, not the president or Congress. "I would urge people who are taking over the department now to remember this is the Department of Justice for everyone," she said, without mentioning Attorney General Jeff Sessions by name. "As you look at the rule of law, it's not just words on the page. It's the impact on people's lives." CAMBRIDGE, Mass. (AP) — Former U.S. Attorney General Loretta Lynch is scheduled to speak at Harvard University. The nation's 83rd law enforcement chief is the keynote speaker at Harvard Kennedy School's annual Black Policy Conference on Friday. Lynch led the Justice Department from 2015 until Barack Obama's second term ended this year. She was the first African-American woman to hold the position. HELENA, Mont. (AP) — The U.S. attorney for Montana has hired a prosecutor to focus on civil rights, part of a nationwide push by former Attorney General Loretta Lynch. The job will be handled Brendan McCarthy, an assistant U.S. attorney for the past four years, Lee Newspapers of Montana reported Sunday (http://bit.ly/2jcXd7C). NEW YORK (AP) — Credit Suisse is paying $5.3 billion to settle claims that it misled investors about the quality of mortgage-backed securities that it sold in the lead-up to the 2008 financial crisis. In the agreement with the Department of Justice, the Swiss bank acknowledged that it knew the mortgages it packaged and then sold as securities did not meet underwriting standards. The FBI arrested the wife of Pulse nightclub shooter Omar Mateen on Monday, according to the New York Times. Noor Salman was charged with obstruction of justice in connection with the June 12, 2016 attack at the gay nightclub in Orlando, the report said. "I can confirm the arrest did occur," Attorney General Loretta Lynch said on MSNBC. 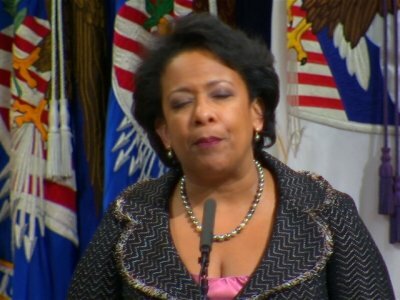 BALTIMORE (AP) — As a younger lawyer, Loretta Lynch prosecuted New York police officers who sodomized a Haitian immigrant in a precinct bathroom. As attorney general, she's broadened her focus to go after entire police departments for unconstitutional practices. BIRMINGHAM, Ala. (AP) — Attorney General Loretta Lynch, in her final speech as head of the Justice Department, praised the work of the Obama administration to advance the dream of justice and said worries of difficult days ahead should be a call for action, not despair. BALTIMORE (AP) — American criminal investigators are continuing to pursue soccer corruption, according to outgoing Attorney General Loretta Lynch, who initiated the prosecution of fraudulent FIFA executives. Lynch attracted global attention by jolting the world's most popular sport, launching sprawling criminal cases that burst into view with early morning arrests in May 2015 at a luxury hotel in Zurich ahead of the FIFA presidential election. CHICAGO (AP) — Chicago officials are pledging to revamp the city Police Department following a scathing federal report, but a change in presidential administrations could spell uncertainty for the critical next step in the process: negotiating a court-enforceable improvement plan with the Justice Department. Black Lives Matter activists say they don't trust Chicago Mayor Rahm Emanuel to reform the Police Department after the U.S. Justice Department concluded officers have used excessive force and violated people's constitutional rights for years. U.S. Attorney General Loretta Lynch is calling for a continued commitment to community policing, just days before she leaves office and a new administration takes over. Lynch spoke Thursday at the University of Baltimore law school, about five hours after she and Democratic Mayor Catherine Pugh announced a court-enforceable agreement to improve policing in Baltimore. BALTIMORE (AP) — The Baltimore police department committed to a sweeping overhaul of its practices Thursday under a court-enforceable agreement with the federal government. WASHINGTON (AP) — Six high-level Volkswagen employees from Germany have been indicted in the U.S. in the automaker's emissions-cheating scandal as prosecutors made good on efforts to charge individuals in a corporate corruption case. But bringing them to trial in the U.S. is another matter. BALTIMORE (AP) — Attorney General Loretta Lynch is scheduled to travel to Baltimore to deliver a speech on community policing. Lynch is set to speak at the University of Baltimore Law School on Thursday afternoon. She also is expected to attend meetings with community members, law enforcement and other local officials. The visit comes as Mayor Catherine Pugh says her administration is working to complete a consent decree this week with the federal government to overhaul police practices. BALTIMORE (AP) — Baltimore's mayor says her administration is close to an agreement with the federal government to overhaul police practices. The Baltimore Sun reports (http://bsun.md/2iXudyK ) that Mayor Catherine Pugh said Monday that their goal is to be done this week. Last month, Attorney General Loretta Lynch put pressure on Baltimore saying "the ball is in the city's court" to conclude negotiations soon. BOSTON (AP) — United States Attorney for Massachusetts Carmen Ortiz, who prosecuted the high-profile cases of Boston Marathon bomber Dzhokhar Tsarnaev and Boston mobster James "Whitey" Bulger, is stepping down. Ortiz said she submitted her resignation as the state's top federal prosecutor last week and spoke with Attorney General Loretta Lynch Tuesday to confirm her departure. She didn't indicate what her next position would be.